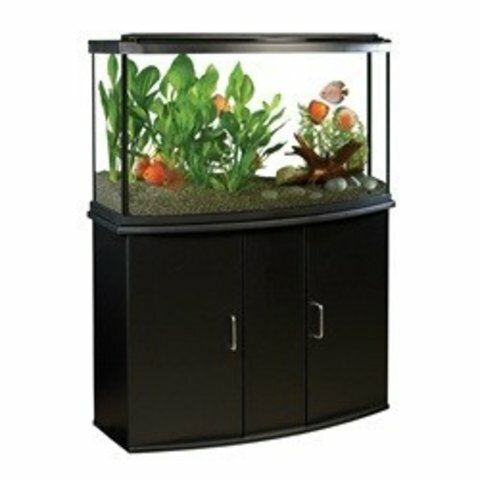 Ideal for the beginner and seasoned aquarist, the 45 gal bow front freshwater aquarium comes fully equipped with many of Fluval's premium and energy-efficient product innovations. The kit features a low-profile LED light that generates 1470 Lumens and 8,000K and is an ideal choice for planted aquariums. Additionally the light can be upgraded to a second light strip to customize the viewing experience. Also included is Fluval's popular C4 power filter, which provides industry-leading 5-stage filtration. All essential Fluval water treatments, protein-rich food, net, thermometer and care guide are provided as well. A matching cabinet is available separately (item # 15768).